Isothermal titration calorimetry (ITC) is one of the main techniques to determine specific interactions between molecules dissolved in aqueous solution. This technique is commonly used in drug development programs when low-molecular-weight molecules are sought that bind tightly and specifically to a protein (disease target) molecule. The method allows a complete thermodynamic characterization of an interaction, i.e., ITC enables direct determination of the model-independent observed interaction change in enthalpy (ΔH) and a model-dependent observed interaction affinity (change in Gibbs free energy, ΔG) in a single experiment. The product of temperature and change in entropy (TΔS) can be obtained by the subtraction of ΔG from ΔH, and the change in heat capacity (ΔCp) can be determined as a slope of the temperature dependence of the binding ΔH. Despite the apparent value of ITC in characterization of interactions, it is often forgotten that many protein-ligand binding reactions are linked to protonation-deprotonation reactions or various conformational changes. In such cases, it is important to determine the linked-reaction contributions and obtain the intrinsic values of the changes in Gibbs energy (affinity), enthalpy, and entropy. These energy values can then be used in various SAR-type structure-thermodynamics and combined with structure-kinetics correlations in drug design, when searching for small molecules that would bind the protein target molecule. 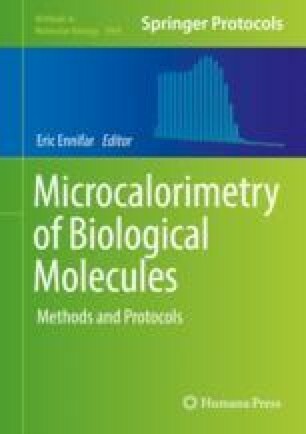 This manuscript provides a detailed protocol on how to determine the intrinsic values of protein-ligand binding thermodynamics by ITC.